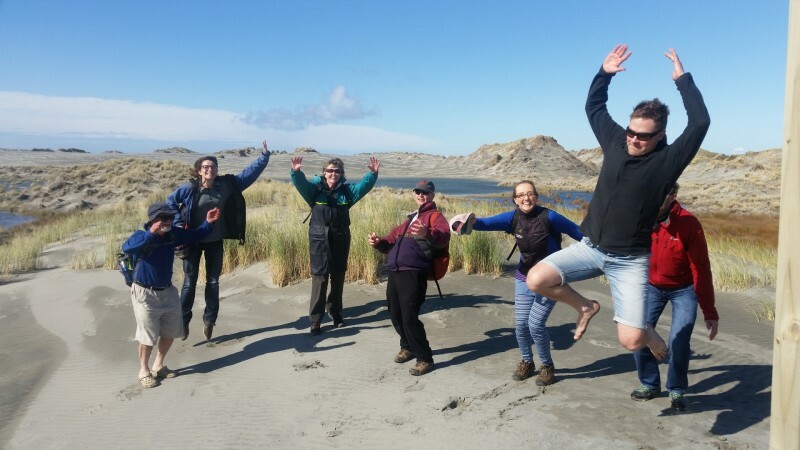 Contributors express how they really feel about being part of Rameka during an excursion to Farewell Spit. By August, the necessary funding had been secured and negotiations were well down the track for purchasing the land to add to the Rameka carbon forest. Yeeha! It was time to show everyone what their contributions were going towards. 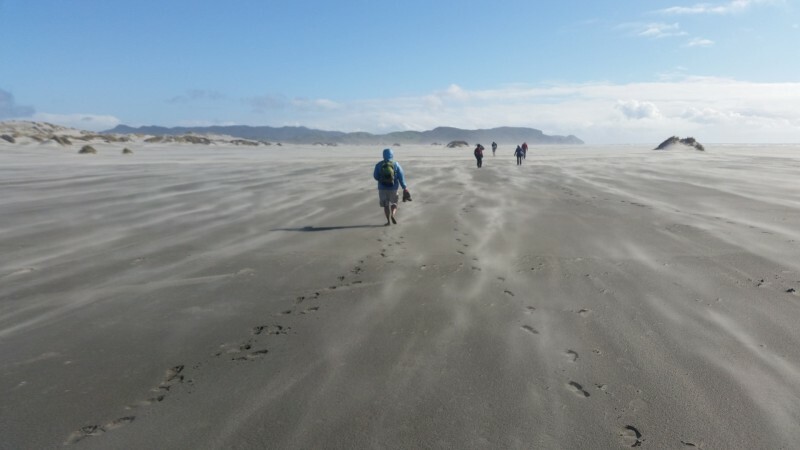 Jonathan hired a bus and accommodation at a backpackers in Takaka township for a week of exploration and celebration – and the contributors responded in kind. From Christchurch, Mapua, Wellington and Masterton, for one night to seven days, the size of the group ebbed and flowed as work commitments allowed. We started by meeting in Mapua to help the locals plant a roadside reserve, then after fish and chips at the wharf (in brilliant sunshine of course! What else could you expect from a visit to Mapua? ), we continued over the hill for our first sighting of the new-look Rameka. 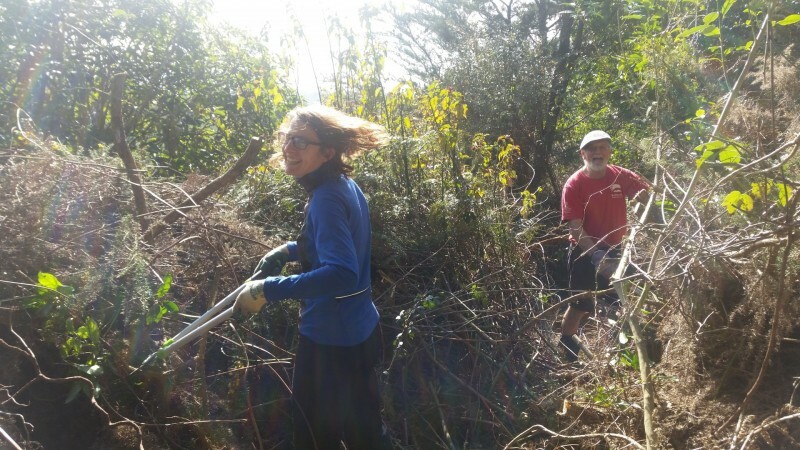 The next day, Sunday, was totally committed to the land. We planted and explored both the new block and the existing Rameka. The start of the working week meant that many of the troops had to say goodbye and return to their working lives, but they were replaced by others! 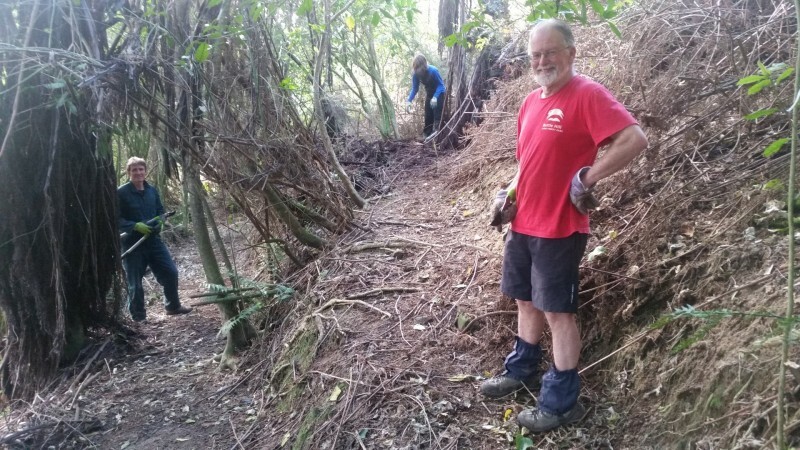 Over the rest of the week, we planted more trees – concentrating on rata from Project Crimson this time, worked with neighbours to put in a new waterpipe and cleared some of the historic Rameka pack track on the new block of land. Sonja Mitchel and Paul Bruce attack the blackberry and Himalayan honeysuckle with aplomb.It wasn’t easy work, but somehow, Sonja and Paul managed to make it look like a ball! One of the easier sections; a zigzag remnant of the original Rameka pack track, originally built in the late 1800s. And there was even time for exploring the further reaches of the Bay.